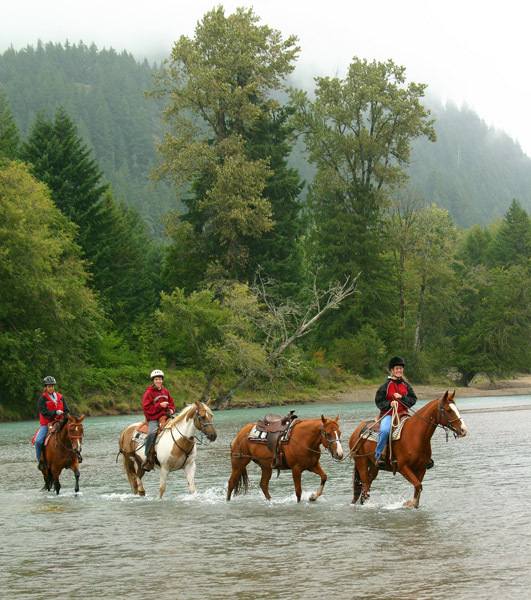 If you're in the Lewis County area and enjoy horses or mules and the great outdoors, we'd like to welcome you. If you're interested in trail riding, campouts, great potluck food, socializing and doing your part to assure continued recreational opportunities on our public lands, then this just might be the organization for you. You can make a difference by learning and teaching methods of responsible use of our public lands and have a great time in the process. Our Chapter activities include trail rides, campouts, trail building and maintenance, monthly meetings, potluck dinners, state BCHW general membership and in general having a good time with folks that share our interests. If this sounds interesting, take a look at our state web page. You're welcome to contact us for more information or come to one of our meetings and meet a good group of folks that share your interest. Thanks for stopping by. The Lewis County Chapter of the Backcountry Horsemen of Washington normally meets on the first Wednesday of each month at the Salkum Fire Hall. If you are interested in coming to one of our meetings, please call or email to confirm the location and time. Membership is open to anyone who shares the objectives of the Chapter. The BCHW membership is $41.00 for single and $54.00 for family membership. The Chapter dues are $5.00. Contact the President listed below for an application. Or get an application by clicking here.